On 22nd February, our Singapore campus saw another successful round of SP Jain Xpressions. The speaker for the session was EMBA alumnus Azhar Othman, Regional Managing Director at Enercon Asia Pte Ltd. He spoke on the topic "Mind your Future; Success Starts from the Present". During the session, Azhar shared how he saved a company that was on the verge of closure and turned it around to a multi-million-dollar business spanning across Asia. 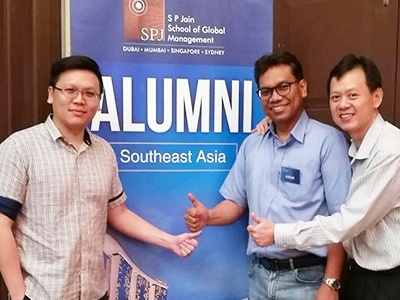 A group of passionate alumni joined us at the Singapore Campus on 8th February, for the SP Jain Alumni Mixer. Sharing real insights into the changing career market and the potential in the industry they currently represent, the alumni shared their study and work experiences with our current MGB and Global MBA students. The discussions delved into various topics including Marketing, Finance, Supply Chain, and Technology.